Oh, if I were in charge of the Canada’s Food Guide I think I might make special perfect foods like lemon and cilantro their own food groups. I may be very attracted to these two particular foods because they are so similar. So similar you ask? One is a fruit and the other a leafy plant. One yellow, one green. One ‘sturdy’, the other more delicate. How could they possibly be similar. Well, for me, I often find that when I use lemons or cilantro is a dish, I tend to use describing words like: ‘bright, uplifting, packs big flavour’. They are both ‘happy’ foods. They make their dishes ‘happy’. Not moody like chili or earthy like beets. So for this reason, whenever I am considering making a dessert, I more often than not tend to thing lemon. Although we don’t have dessert often, the other night I had 4 egg whites to ‘move along’. They had become the off-spring of the weekend’s eggs benedict’s hollandaise sauce. Despite the muggy weather, I did the risky thing and converted the egg whites into meringue. We were having special company for dinner and so I constructed 6 well sized nests. My inspiration for the dish came from a Lucy Waverman recipe in the LCBO’s Food & Drink Holiday 2007 edition called Lemon Meringue Mousse Cake. Instead of one big meringue, I made 6, one for each for each of my guests. I divided the lemon mousse in half and folded about a half cup of whipped cream into one of the halves. I layered lemon mousse with a lemon mousse whipped cream combo and topped with whipped cream. In general, I used less whipped cream in total than what was called for (1 1/2 cup). I used dark chocolate instead of white for the garnish. And I skipped the lemon dust since I had run out of lemons, but is a really nice touch. A bold, bright taste! 🙂 But I did have a lot of blueberries, so everyone received a few of these. What types of foods make you think happy? 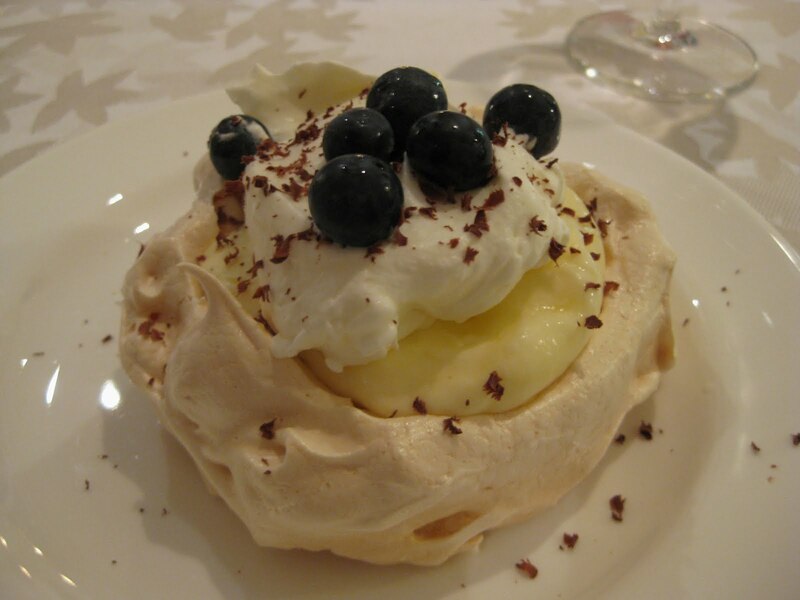 This is an easy meringue to make. The filling is very lemony. If you are an experienced cook then do the Lemon Dust for the tart, otherwise just omit. To shave white chocolate, use a vegetable peeler – otherwise, grate it. Beat egg whites in an electric mixer until frothy. Slowly beat in sugar. Continue to beat until egg whites are thick and glossy and stand straight up when beaters are lifted out. Beat in lemon juice. Draw a 10-inch (25-cm) round on the parchment-lined baking sheet and scoop mixture into round, spreading meringue mixture to the sides to make a shell. The sides will be about 2-inches (5-cm) high. It should look like a pie shell. Bake for 1½ to 2 hours or until lightly browned and dry. Turn oven off and leave for about 4 hours to cool. Whisk together eggs, sugar, lemon juice and rind together in a pot to make filling. Combine cornstarch and water in another bowl then stir into lemon mixture. Bring to boil over medium heat, whisking constantly. Remove from heat. If lumpy, pour through a strainer into a separate bowl. Cover with plastic wrap, pressing the wrap into the surface of the lemon filling to prevent a film from forming, and refrigerate until needed. Spoon lemon filling into meringue shell. Whip cream until it holds its shape and spoon onto top of lemon filling. Scatter with white chocolate shavings and Lemon Dust, if using. LEMON DUST: Remove the zest from 2 lemons. Use a zester if possible for uniformly thin strips. Place zest in a small pot and cover with water. Bring to a boil, drain and return zest to pot. Cover with water and repeat twice more (this helps the zest dry evenly). Pat dry zest with paper towels. Place zest on a sheet of parchment paper and microwave on high for 7 to 8 minutes, or until zest is dry and crisp but not brown. Grind to a powder in a coffee or spice grinder. Makes about 2 tablespoons of Lemon Dust.